Fitbit’s newest smartwatch is a bona fide hit. The company announced earlier this week that it has already sold more than 1 million Versa watches, and it’s not terribly surprising when you consider how impressive this new model is. Apart from being remarkably sleek and having a gorgeous display, the Versa is packed full of great features and it has 4-day battery life. 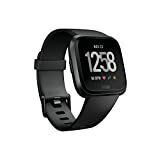 If you haven’t picked one up already, we highly recommend checking out the Fitbit Versa Smartwatch, which is in stock on Amazon right now with free Prime shipping.